Identifying zero day vulnerabilities is of utmost importance for governments to prevent them from being used by extremist groups for infiltrating a nation’s critical infrastructure. This is a primary factor fuelling demand from the global cyber weapon market, states Transparency Market Research (TMR). Cyber weapons developed by hackers are aimed at exploiting confidentiality. However, depending on the method of use, they can be classified as either defensive or offensive cyber weapons. Both these market segments are presently gaining from the increasing demand for identifying zero-day vulnerabilities. When used for offensive purposes cyber weapons can lead to mass destruction. Due to growing threats associated with cyber weapons, various international organizations have described them as malicious codes. Stringent regulations are thus being implemented to curb their use against the human race. This factor is likely to inhibit the market’s expansion to an extent. Nevertheless, in regions such as North America, governments are proactively investing in the development of advanced cyber weapons to protect their critical utilities. This will create new opportunities for growth for the market in the near future. According to TMR, the global cyber weapon market was valued at US$390 bn in 2014. Exhibiting a CAGR of 4.4%, the market is expected to reach US$521.87 bn by the end of 2021. Based on type, the global cyber weapon market has been fragmented into defensive and offensive cyber weapon segments. 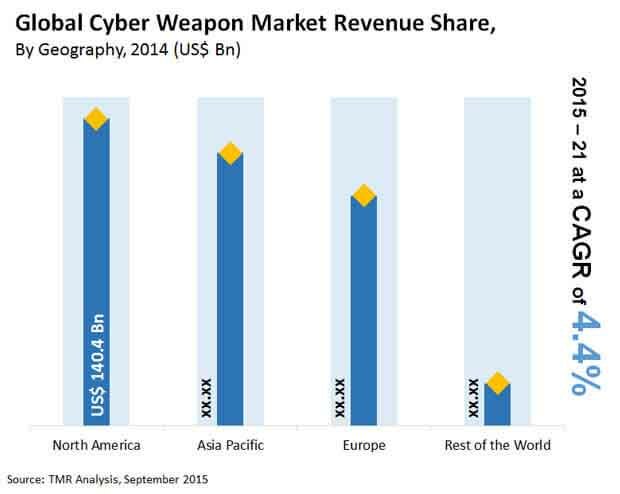 In terms of revenue, the defensive cyber weapon held the larger share of 73.8% in the market in 2014. The increasing cases of cyber espionage have compelled governments and private organizations to focus on technologies to safeguard their critical infrastructure. Since information technology is integral to industries such as manufacturing, defense, and aerospace, they are more vulnerable to cyber thefts. The demand for defensive cyber weapons is therefore expected to continue to surge through the forecast period. The offensive cyber weapons segment is currently at a premature stage. However, TMR expects the cyber weapons market to gradually shift from defensive to offensive weapons. Nations around the world are strengthening their offensive cyber capabilities due to the emergence of cyber as new platform for warfare. However political and legal issues associated with offensive cyber weapons have compelled governments to implement stringent regulations to ensure non-proliferation of offensive cyber weapons. This has a negative impact on the segment. From the geographical standpoint, North America dominated the global cyber weapons market with a share of 36% in 2014. TMR forecasts the region to maintain its dominance in the market through the forecast period. The Internet is the backbone of critical infrastructure such as industrial control, air traffic control systems, and military defense in the U.S. The country has witnessed several attacks on its critical infrastructure in the past. Its government is therefore investing in developing novel technologies to prevent future cyber-attacks on such critical utilities. Such developments will significantly aid the expansion of the cyber weapons market in North America. In 2014, Asia Pacific was another key market for cyber weapons. The rising demand from countries such as India, China, North Korea, Australia, South Korea, and Japan will boost the cyber weapons sales in the region. Furthermore, the increasing investment by China in the development of advanced cyber warfare technique will significantly aid the market’s expansion in Asia Pacific. The Boeing Company, Lockheed Martin Corporation, General Dynamics Corporation, Raytheon Company, BAE Systems plc, and Northrop Grumman Corporation are some of the leading players operating in the cyber weapon market. Cyberspace has emerged as the new domain for warfare. Any information technology (IT) based system connected to the Internet is vulnerable to cyber-attacks. Cyber weapons are advanced cyber warfare tools that are powered with weaponized zero-day exploits or vulnerabilities in software primarily aimed for launching an effective cyber-attack on enemy networks. Hackers and cyber professionals are increasingly focused on developing cyber capabilities to infiltrate into enemy networks in order to violate confidentiality of the target. Additionally, cyber weapons are capable of data theft, espionage, and destruction of equipment and other critical systems such as industrial control system and national defense system. The cyber weapon market is anticipated to grow during the forecast period owing to the increasing investment by government and utility organizations to identify zero-day vulnerabilities or exploits in a system or software application. Intelligence agencies, government, and other organizations are increasingly investing in cyber units and other cyber resources to identify zero-day exploits and use them against enemy systems or networks when necessary. Additionally expansion of traditional arms manufacturing companies such as Lockheed Martin Corporation, BAE Systems and Raytheon Company among others in cybersecurity business is driving the market growth. Demand for advanced cyber warfare techniques is further fueling the growth of this market. Furthermore, growth of cyber weapon market is attributed to the increasing need for security in critical infrastructure and utilities including national defense system, industrial control system and smart power grid among others. The major factor restraining the growth of this market is due to the rising government regulations on non-proliferation of cyber weapons aimed to restrict usage of cyber weapon to ethical hackers, legal cyber professionals and organizations only. Emergence of cyber as new domain for warfare is paving new opportunities for new and existing players in the market. Cyber weapon is considered as complementary to conventional warfare techniques. Additionally, cost-effectiveness of cyber weapons is leading to reduced funds for military expenses, thus providing new opportunities to players in the cyber weapon market. National defense system, industrial control system, smart power grid and communication network are major application segments of the global cyber weapon market. The growth in these application segments is attributed to the rising need for acquiring cyber capabilities including defensive and offensive cyber weapons across the globe by government and other spy organizations. Currently focus on development of defensive cyber capabilities is leading to defensive cyber weapon market growth. However increasing need for developing offensive cyber warfare techniques due to emergence of cyberspace as a new domain for warfare is driving the offensive cyber weapon market growth. This market research study analyzes the cyber weapon market globally and provides estimates in terms of revenue (USD billion) from 2015 to 2021. It recognizes the drivers, restraints and opportunities affecting the industry and analyzes their impact over the forecast period. The report segments the market on the basis of geography as Europe, North America, Asia-Pacific (APAC), and Rest of the World (RoW), and these have been estimated in terms of revenue (USD billion). In addition, the report segments the market based on the type, which include defensive and offensive. It also segments the market on the basis of application as national defense system, communication network, industrial control system, financial and banking, smart power grid, air traffic control, automated transportation system and hospitals. All these segments have also been estimated on the basis of geography in terms of revenue (USD billion). For better understanding of the cyber weapon market, we have given key market trends. Furthermore, the study comprises a market attractiveness analysis, where the applications are benchmarked based on their market scope, growth rate and general attractiveness. The report provides company market share analysis of various industry participants. The key players have also been profiled on the basis of company overview, financial overview, business strategies, and the recent developments in the field of cyber weapon. Major market participants profiled in this report include Lockheed Martin Corporation, The Boeing Company, BAE Systems plc, Raytheon Company, General Dynamics Corporation, Northrop Grumman Corporation and Airbus Group SE among others.